The Reedsport Main Street Program is seeking two people to be Board members for the program. If you are interested please contact me. 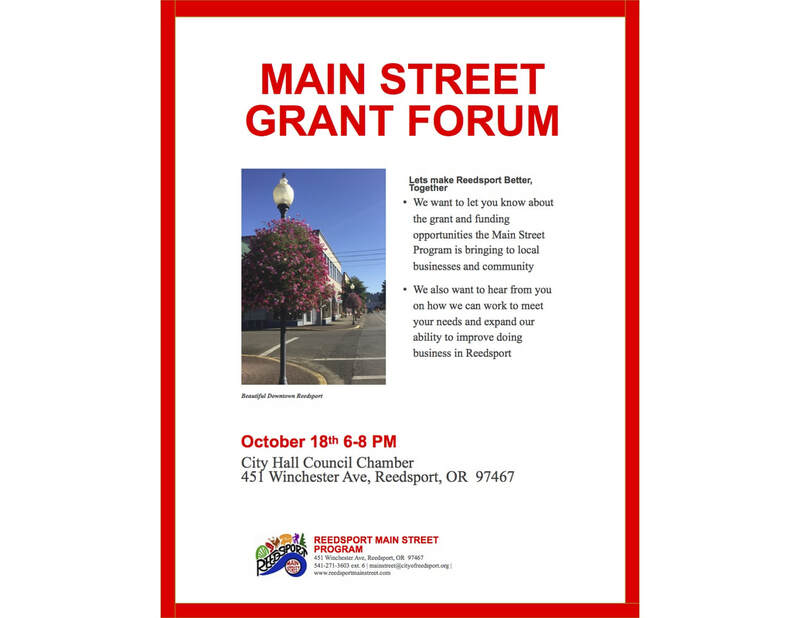 Our new Main Street Program coordinator, Emerson Hoagland, is on the job and planning a Main Street Grant Forum which is described in the flyer below. Weekly update - Keep on pulling! It’s time for a new chapter in the Reedsport Main Street Program, the changing of the guard! I’m so excited to see what the next RARE coordinator will bring to the program and to the community. Whoever it is, their fresh pair of eyes will help us find solutions, ideas, and resources we haven’t tapped yet. Every time we hear another first impression, we learn valuable things about ourselves. What will their first impression be? I can’t wait to find out! I’m confident that Reedsport will welcome them in just like it has welcomed so many recent newcomers, weaving their new perspective into the permanent fabric of our little town. The next coordinator won’t arrive until September, but so much happens before then! The biggest upcoming event is the ribbon cutting for the new Reedsport Cycle Stop. That’s right, the Bike Pods are ready for use, and other pieces are coming together. Join us at 10am tomorrow, Friday the 14th, to celebrate the accomplishment. The Reedsport Cycle Stop is right in front of Safeway or you can find it on Google Maps. What’s next for the site? That’s up to you! If you want fund raise, build things, donate things, create artwork, or otherwise help add improvements to this budding project (the potential is huge!!) please email me, contact the City of Reedsport, or come to a Reedsport Main Street Program meeting. Let’s go from great to amazing! The Promotion Committee is planning Reedsport’s first (as far as we can remember) tree lighting ceremony this year on November 26th, the Saturday after Thanksgiving, in Lions Park. This is a wonderful opportunity to launch a new Reedsport tradition, one with carolers and hot cider, lights and festivities. Live reindeer? (Does anyone have one?) The beauty of heading up a new tradition is that it can be anything we want. Do you want to help make it something? Contact the Promotion Committee or come to their next meeting…we would love to have you! So everyone gather up your contingency rain gear – yes, technology has advanced to the point where we can stay dry in the rain – and mark your calendars for November 26th to turn on the lights of Reedsport! One final call for ordering your engraved brick before I leave! If you want it to come in the next order, contact me before 4pm on Friday, July 15th. If you wait until after that time, it will be ordered, but perhaps not for several months. Everyone is invited on a trip to Salem to support Fred Wahl Marine Construction’s grant application next Thursday, July 21st. A free bus will leave City Hall at 6am and return at 5pm. You’ll get a free t-shirt to wear for the day, yours to keep! If you want to support the expansion of a Reedsport business simply by helping form a crowd in the room that makes everyone in Salem say, “Wow, Reedsport!” call the City of Reedsport to let them know you’re coming (better) or just show up (okay). Go Reedsport! As a side note, July 21st, 1919 was also the date of the first election ever held in Reedsport. It’s a very good day to show your local pride! July 15, Friday – Ribbon cutting at the Reedsport Cycle Stop, 10am. Also my last day. July 19, Tuesday – RMSP Board of Directors meeting, 5pm in the conference room at City Hall. July 21, Thursday – Trip to Salem to support FWMC. A free bus leaves City Hall at 6am and returns at 5pm. August 1, Monday – Buzz on Biz, hosted by the South Coast Development Council. The topic for local business owners will be “Social Media Marketing and Outreach.” Time and location TBD. 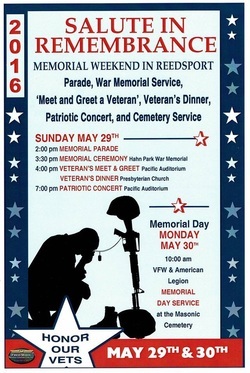 Please contact the City of Reedsport or SCDC at http://www.scdcinc.org for more info. August 10, Wednesday – RMSP Economic Development Committee, 5pm in the conference room at City Hall. August 15, Monday – RMSP Promotion Committee, 5pm at the Waterfront Restaurant. November 26, Saturday – Tree lighting ceremony in Lions Park, time TBD. Please remember that except for the above dates the Promotion Committee usually meets on the 2nd Tuesday of the month, Economic Development on the 2nd Wednesday, and the Board of Directors on the 3rd Wednesday. Have you ever seen the tall ships Lady Washington and Hawaiian Chieftain? They come to Coos Bay every now and then, and it’s well worthwhile to pay them a visit. Several years ago I worked on another tall ship, the Adventuress, where one of my jobs was to stock the educational aquarium for the day. One morning I woke up early before anyone else to hop off the ship and hunt for marine critters. But when I stepped above deck, a terrible sight met my eyes. The five dock lines had not been drawn tight the evening before, and during the night the ship had pulled away much too far to jump over the water to the dock. What could I do? If I couldn’t get ashore, our program would lose an educational station for the day, leaving an entire class of 10-year olds wandering around aimlessly, wreaking havoc, starting down a lifelong path of moral degeneracy all because their young minds had never learned about the fantastic digestive habits of starfish. I thought about doing nothing, maybe waiting until everyone else woke up, but in a moment of panic and determination, I grabbed one of the heavy dock lines and began to pull. And pull. And pull. For quite a while nothing happened, and then very slowly the entire 133-foot ship began to inch towards the dock. Finally it tapped against the bumpers, and I was able to jump off to begin my day. It still amazes me that one little person was able to move something that big. Imagine what several people can do! That can be the story of Reedsport, a community of people who see a goal and don’t give up on it. When I was riding my bike home from work the other day I took a route through downtown and along the riverfront. For just a moment I could see other bicycles on the road, the sidewalks filled with wandering pedestrians, cute buildings bright with color, music, artwork, and never enough parking for everyone who wants to be there – a vibrant waterfront community, rich with history and small family businesses. I could stand and look wistfully at that vision like it’s a leap too far to make, or I can start pulling on the dock line, even if it seems foolishly hard to do. That is what every day of the past year has been. Thank you all so much for allowing me to serve Reedsport as the coordinator of your Reedsport Main Street Program. It has been a great year of learning and doing. Here is my parting thought: Whatever your vision may be, don’t just look. Start pulling. Keep pulling! The ship will move. Latest news - Listening and looking forward! Sad to say I only have one more week to go before I wrap up my AmeriCorps term as coordinator for the Reedsport Main Street Program. It’s been a flurry of a year, but I’ve been grateful for the opportunity to serve. I’ve enjoyed how the Main Street Program invites everyone to the table to look for solutions, no matter where we come from, our political beliefs, what kind of education we have, or the other small things divide us. The Main Street Program is about finding common ground to pursue a common goal, the goal of making Reedsport better. Everyone I have worked with over the past year shares that goal. Although we have different ideas about how to get there, we’re all working towards the same end result. A small town can sometimes act like an echo chamber, where one little insult or argument bounces around, growing larger and larger, until certain people refuse to listen to certain other people. With all of our other challenges, we can’t afford to do that to ourselves. The Main Street Program has been a great platform to keep our ears open and the conversation going. So many good things have happened over the past year, and one of the most exciting ones is the creation of the Reedsport Cycle Stop. Over the past weeks Public Works has installed nautical-style fencing, a picnic bench, and a work stand with a set of tools for bicycle repair. The next couple of weeks will see the addition of a bike rack, trash can, benches, and two prototype Bike Pods. The Bike Pods are single-bicycle parking units with a hard plastic shell that protects bicycles from the elements. These two prototypes are generously on loan from Huntco Site Furnishings, a Portland-based manufacturer of commercial outdoor furnishings. We’re very excited that Reedsport has been chosen as the test site for the Bike Pods! Go and check them out when they’re installed – you won’t be able to miss them! Also a big thank you to Reedsport Public Works for all the time they have put into this project. The Design Committee is on hiatus until the current cycle of the Façade Improvement Grant is finished. What would you have said? Would you have turned off the radio? That happened early in my time there. Later I learned that Ed, who struggled with so many things, was actually something of a musical genius. He would sample short clips of sound and loop them back on themselves using an electronic keyboard, repeating them and building them to form complex, beautiful patterns. He held concerts, working with other musicians, folding their sounds in with his patterns. I truly believe he heard something in the static that I could not. It was a good lesson. We’re all uniquely equipped to “hear” different things in our community. Being a lover of nature, I appreciate things in the forest and field that I know not everyone picks up on. Others have told me how much they love the small industrial look of our waterfront, something that escapes me but is true all the same. What is your unique way to appreciate Reedsport? Latest news - Celebrating Milestones! A big thank you to the volunteers who came last Saturday to our community cleanup day! We washed the interpretive signs on the Umpqua River boardwalk and painted bicycles all over the trash can for the new Reedsport Cycle Stop. Our toughest projects were weeding the area around where the old A-frame building used to be (one of the first places people see when they arrive from the north) and weeding the area around the old Midas gas station, including reclaiming part of the sidewalk from overgrown plants. We are so grateful to live in a place where you can hear the plants growing, but we do have to keep our pruning shears always at the ready, especially for aggressive non-natives like holly, ivy, and Himalayan blackberry. (You should never feel bad about hacking these away immediately.) Take a look at the work that our wonderful volunteers did to help clean up our town. What would it take to get you to join us next time? A different day? A different project? Let me know so we can include you in our next volunteer day. There’s still a lot of good work to do! Speaking of doing good work, this week we’re saying a sad “Goodbye and Happy Retirement” to Vera Koch, Reedsport’s longtime Finance Director. Vera has been responsible for maintaining the budget for the RMSP as well. I can’t count the number of times she’s helped me sort through difficult financial snarls. Reedsport could not ask for a friendlier, more honest, harder working person to be responsible for our finances. (I get to see this firsthand every day by working here in City Hall.) If you want to thank Vera in person for her service to our community, please come to the Open House tomorrow, June 30th, from 3pm to 5pm in Reedsport City Hall. We are also working with the University of Oregon to scan and upload the entire Port Umpqua Courier from 1914 to 2002. If we can raise the funds, this entire newspaper will be free and searchable online just like the City Council minutes. Right now our historic hometown newspaper is available only on microfilm, and that microfilm is only held in Eugene and Portland…not exactly easy to access. The paper is split across forty reels, and each reel will cost $50 to scan. Would you like to sponsor a reel and put several years of the Courier online for everyone to enjoy? Please contact me! The theme of this update seems to be milestones and history, so I’ll finish up with a question about a historic milestone. In 2019, Reedsport will turn 100. (Reedsport was founded in 1911/12, but incorporated in 1919.) Here is your assignment. What do you think Reedsport should do to celebrate its centennial year? A centennial celebration…we only get to have it once. Let your imagination run wild and send in your ideas! Latest news - Chainsaws and Bicycles! Thank you so much to everyone who came and supported us at last weekend’s Chainsaw Carving Championships. The RMSP booth was set up directly opposite the steam donkey, so we were able to show videos of how it was saved from the swamp in 1994, show pictures of what it looked like just a few weeks ago, and then say, “Turn around and look at it now!” Thanks to Jonathan Wright and Fred Wahl Marine Construction, the steam donkey now has a shiny new coat of paint and a new stack for the top. Another huge thank you to Frank and Ruby Barth, Linda McCollum, Doug and Cathy Perry with Signs and Shirts Unlimited, and Sue Cousineau, who all helped our booth raise over $1,100 additional funds to restore the steam donkey! Once we’re finished with the structure, we’ll keep raising money to create a beautiful new setting to showcase it. It was wonderful weekend to share Reedsport’s logging heritage with so many visitors! If you want to help us keep making a difference, join us this Saturday, June 25, for a day of fun, food, and fixing up our town. Our community volunteer projects will include trimming weedy properties along Highway 101, cleaning interpretive signs on the river boardwalk, trash pickup, painting, and perhaps a few things more. Wear clothes that can get dirty and bring work gloves if you have them. We'll provide lunch at noon. Meet at Champion Park at 10:30am, or come find us as we work around town. We’ll work from 10:30 to 4pm, and we’d love to have you for all or part of the time. RSVP appreciated but not required. You may have noticed the flagging tape next to the Recreation Station. What’s happening there? Well, the Reedsport Cycle Stop has officially broken ground! Frank Maxwell has put together the first of the nautical-themed posts that will protect the site from traffic. These posts will match the ones he made uptown next to RV Masters, carrying the nautical theme through town. This week Reedsport Public Works has been out preparing a pad for the bicycle repair work stand. Last weekend some of our fantastic volunteers and philanthropists purchased two benches from the Chainsaw Carving Championships for the site. We have signs, we have Bike Pods, and we have excitement, so expect to see things appear at the site very soon and very fast! Phase one will be fairly basic, but we’re hoping that the community will continue to help us improve this area into something beautiful and useful for everyone. Read more about the project here. The work funded by our latest round of the Façade Improvement Grant continues to progress. Have you seen the completed brickwork on Defeat River Brewery? We can’t wait to show off the before and after of these projects. Thank you to everyone who has donated to this grant, a grant that we’re only able to offer through the generosity of local individuals and organizations who have chosen to invest in our small hometown businesses. If you want to support our businesses through this grant, donate to the RMSP and we will make sure that your dollars go to sound projects that have been reviewed and approved. Speaking of supporting local businesses, don’t forget that our two farmers markets are now up and running every Friday, Old Town on 4th Street and Umpqua County on East Railroad Avenue. Farmers markets are a great way for small businesses to grow into brick and mortar stores, not to mention encouraging the local agriculture that our area used to have in such abundance. Tonight the Promotion Committee is meeting a 5pm in the Waterfront Restaurant, our new time after we postponed last week’s meeting. That’s it for scheduled meetings in the month of June. Go forth and enjoy the summer! Weekly update - The City says "Thank you!" Just a reminder that everyone who has volunteered for the City of Reedsport is invited to the volunteer appreciation luncheon tomorrow, June 10th, at 12pm in the Community Building. This includes all organizations affiliated with the City, so if you have been volunteering for the dog shelter, Discovery Center, Main Street Program, et cetera, please come let us thank you for your service (spouses are welcome too!) If you haven’t been volunteering lately, consider giving a little time this coming year to a cause that makes you happy. We’re not wishing for things to happen – we’re going out and doing them! One of those things is the Reedsport Cycle Stop, a new facility we’re building next to the Recreation Station along Highway 101 in the middle of town. The Cycle Stop will give bicyclists a place to park their bikes, rest, and shop nearby. It’s not just for the thousands of long-distance cyclists that come through in the summer, but for locals who, for example, want to make a trip to the grocery store without a car. The Reedsport Cycle Stop is a step towards building infrastructure to make our town more friendly to anyone who enjoys the fresh air and exercise of cycling. Keep watching the construction site as new parts of the Cycle Stop are put into place. If you would like to help us build it, consider donating some time, money, or materials to the project. Speaking of projects, another great opportunity to volunteer is approaching. Mark your calendars for Saturday, June 25th, for our next Community Volunteer Spruce Up Day. On previous days we’ve cut brush, cleaned highly visible areas, and made much-needed improvements to neglected spots around Reedsport, all with good conversation and a great BBQ lunch. We’ll meet at Champion Park at 10:30am and work until about 4pm. See you there? For anyone with an interest in history, we have a new page for local history resources on the RMSP website. Ever wondered about listing your building in the National Register of Historic Places? This page includes the 2009 assessment that the State Historic Preservation Office performed for historic buildings and structures in our town. The findings are interesting. (My favorite is what they have to say about Safeway/Umpqua Shopping Center!) If you’re trying to research our area, the resources on this page will give you a good start. Next week the Promotion Committee meets at 5pm on June 14th at the Waterfront Restaurant. The Economic Development Committee meets at 5pm on June 15th in the conference room at City Hall. The following week the Board of Directors will meet at 5pm on Tuesday, June 21st in the conference room at City Hall; Matthew Klebes, Director of The Dalles Main Street Program, will be our 15-minute guest speaker via Skype. As always, you are welcome to attend any of these meetings. Weekly update - Signs of Summer! Who doesn’t love a parade? Reedsport’s had them since the very beginning; I just read a 1921 newspaper article about how the people of Reedsport held a parade to celebrate the results of a local election! It’s great to know that our town has always appreciated democracy. Keep that patriotic tradition alive by joining in this weekend’s Memorial Day celebrations beginning with the parade on Sunday, May 29th at 2pm. This will be followed by a 3:30pm ceremony at Hahn Park, a 4pm Veteran Meet and Greet at the Pacific Auditorium, a Veteran’s Dinner at the Presbyterian Church, and a 7pm concert back in the auditorium. On Monday, May 30th, there will be a 10am Memorial Day service at the Masonic cemetery followed by a 12pm dedication at Hahn Park of a new Highway 101 sign honoring the veterans of Iraq and Afghanistan. A busy weekend with a little something for everyone! While we’re celebrating, a big congratulations to the recipients of our program’s latest Façade Improvement Grant! We selected projects proposed by Defeat River Brewery, Ellie’s Art & Sign, Harbor Light Restaurant, The Myrtlewood Gallery, and The Little Mint. Stop in and give these businesses a high five as they work on their improvements over the next few months. We hope that everyone who didn’t receive the grant this time will apply again next time, and that this will help inspire everyone to think about what you can do to make our town look better. Fortunately it doesn’t take much – a new coat of paint, getting rid of debris, or just planting flowers. The highway is a constant flow of first impressions, so let’s try to make good ones! We had a visit yesterday from Tom Hogue, an economic development specialist, who pointed out that Reedsport’s economic growth will most likely come from homegrown talent like the class reunion crowd - people who grew up here, feel deeply about our town, and come back to invest in it. Other growth results from visitors who fall in love with the place and settle here to be a part of it. From what we’re seeing right now, this is true. Our current growth has come from businesses who have flourished here from small beginnings, from returning alumni, and from visitors who came for a short while and found something that really clicked with them. One thing they all have in common is that emotional attachment, a feeling that there’s something really special about this place. We can’t go out to the job tree and shake down more jobs for our town, but we can actively encourage our kids, show a great time to visitors, and support our small businesses. Small actions, huge ripple effect. Speaking of small actions, our community volunteer projects are really starting to add up. A few days ago I saw a woman setting up her tripod to take birding pictures at the Coho Marina pond where our volunteers cleared back the brush. Last week I met a gentleman at the dog park who thought the city was to thank for widening the sidewalk there. “Nope! Volunteers!” I said. (Although many thanks to the city employees who helped us out a lot!) Little by little, we’re taking back the neglected corners of our town. Do you want to take part in the next community volunteer project day? We are meeting on Saturday, June 25th from 10:30am to 4pm at Champion Park, BBQ lunch provided. We haven’t finalized what we’re working on yet, so please let me know if you have any ideas or projects that you’d love to see happen. If you want to take part, I would love to hear from you! Our projects are determined by who we’ve got and what they want to do. We run on volunteer power! Also mark your calendars for our upcoming committee meetings. The Promotion Committee will meet at the Waterfront Restaurant at 5pm on Tuesday, June 14th. The Economic Development Committee will meet in the conference room in City Hall at 5pm on Wednesday, June 15th. The Board of Directors will meet in the conference room in City Hall at 5pm, June 21, the longest day of the year! (But hopefully not the longest meeting of the year.) If you ever want a copy of the agenda or minutes for any of these meetings, please contact me. We’re no top secret organization. Whatever the calendar says, when I saw that the salmonberries were ripening I said, “Summer’s here!” Maybe it’s the parade that will do it for you, or maybe the soon-approaching end of the school year, but I hope that you find a moment to jump up and say, “Summertime!” Summer in Reedsport, a great time to start blooming! Weekly update - Making a difference! Happy election day! It’s so satisfying to fill in those little ovals on the ballot! The first time I ever voted, I was studying abroad in the jungles of Central America. We had no electricity, but my cabin did have one of those fancy votive candles encrusted with pictures of angels and the Virgin Mary. I sat down on the floor and voted by that candlelight while mosquitoes hammered against the screen windows and birds filled the night with strange music. After that, I knew I would never have an excuse not to send in a ballot. How lucky that we Oregonians can vote so easily! How did people around here manage to vote 100 years ago before there were roads? Maybe that’s a story that was told last Friday at our second community historical collection day. Thank you to all of the people who came to the Lower Umpqua Senior Center to share their history, and thanks to the volunteers who worked hard to record it. I can’t wait to listen to all of the stories people told. My favorite item of the day was a batch of glass plate negatives that perhaps no one has seen since the 1930s! With luck and a little computer fiddling we’ll be able to develop them back into photographs. Check out the online archive at Reedsport100.omeka.net as we continue to upload great materials and stories from these events. Another big (and belated) thank you to the volunteers who helped us at our last community volunteer project day, when we edged the pathway at Champion Park. The grass had really crept onto the pavement over the years. In some places we made the path twice as wide as it had been! That was hard and hot work, but I have already seen people walking side by side, bicycles, joggers, and someone on a motorized scooter making good use of the work we did. If you have an idea for the next project(s) we can work on and you would like to take the lead to help us make it happen, please contact me. Our next RMSP board of directors meeting is tonight at 5pm in the conference room at City Hall, when we’ll have a brief visit from guest speaker Tom Hogue of the Oregon Department of Land Conservation and Development. Nothing official on the calendar this week after that, but if you’re in a fishy sort of mood you might go volunteer to clip fins of salmon fingerlings this Thursday at STEP in Gardiner. It’s a fun way to help our local hatchery that everyone should try at least once! It’s easy during election times to get sucked into big national issues almost beyond our control, so easy to feel like we’re getting blown around in a storm. How reassuring it is just to step back from a hard day’s work doing something to make our town just a little bit better and think, “Yeah, we’ve got this.” This is the level where real change takes place, when people give up their day to volunteer, when we choose to spend at a local business, or when someone takes a minute to fill in those little ovals on the ballot. Wherever you find yourself today, I hope you feel that power you have to make a positive difference in the world! Weekly update - A week of celebrations! Here’s another thing to celebrate – our next community volunteer project day! Tomorrow, Friday the 6th, we’ll be gathering at Champion Dog Park from 10:30am to 4pm to spruce up the area. This will include clearing up the pathways to make them easier for walking, and possibly also some weeding and general trash pickup. Bring work gloves if you’ve got them, as well as any hand tools that might come in handy like shovels, hoes, or clippers. We’ll provide a barbeque lunch at noon. Come for a little, come for a lot, bring your dog, and spend a little time cleaning up a corner of our town! Thank you to everyone who submitted an application for the Façade Improvement Grant! A number of businesses throughout Reedsport proposed many good projects, and a team of RMSP volunteers are now in the process of reviewing them. We will announced the recipients of the grant sometime in the next two weeks. If you missed this grant cycle but want to apply for our next one, look for an announcement in this newsletter, on Facebook, and in the Umpqua Post. You can also call me any time with questions. Next week we’ll be celebrating our local history with a second Historical Collection Day on Friday, May 13th, from 10am to 4pm at the Lower Umpqua Senior Center. Do you have stories to tell about the history of our area? Do you have old photographs and letters, postcards and clippings, farm tools, matchbooks, flags, bonnets, or other artifacts from our area? Come to the Senior Center next week with anything you would like to share with our digital historical archive. We’ll record your stories and make digital copies of anything you bring. Remember, we don’t keep anything but the copies – you take all originals home with you! Come and visit the Senior Center even if you’re not bringing anything to share. We have stacks of old photographs that need your help. Can you recognize local people from 1970 to 1990? If you want to volunteer to help us even more, please come to the conference room at City Hall on Wednesday, May 11th at 3:30pm to learn how you can help us record information for the Friday event. We are working on a system to keep track of every item and contributor, and this helps us juggle a lot of information without losing any of it. There is a need for you no matter what you like to do. Do you like to talk to people? Would you rather handle data? Can you transcribe a recorded interview? Come take part, and let’s truly make this a community effort to save and share the history of the Lower Umpqua. If you are planning to come to Friday whether to volunteer or contribute, please let me know beforehand if you can. The Senior Center would like to offer a $3.50 lunch to everyone, but they need to have an idea about numbers. Next week the Promotion Committee will be sitting down on Tuesday, May 10th, 5pm at the Waterfront Restaurant to discuss promoting things. The Economic Development Committee follows suite on Wednesday, May 11th, 5pm in the conference room at City Hall to discuss economically developing things. And the following week on Tuesday, May 17th, the Board of Directors will meet at 5pm in the conference room at City Hall to discuss directing things. You are welcome to attend any of these and lend your two cents. The projects that we work on are the ones that you, our volunteers, want to see happen in Reedsport! Have a happy week of celebrations!